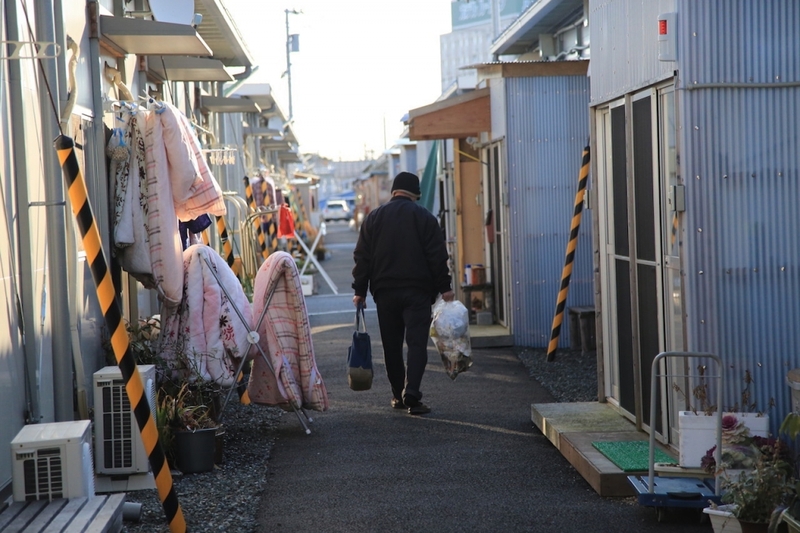 Since the March 11th, 2011 triple disaster (earthquake, tsunami and nuclear meltdown ) in Fukushima, Japan, photojournalist Hiromichi Ugaya has visited the devastated area more than forty times. The Tokyo-based Ugaya’s photos document the destruction and tell the stories of people whose lives will never be the same. Decontamination of a residential driveway. 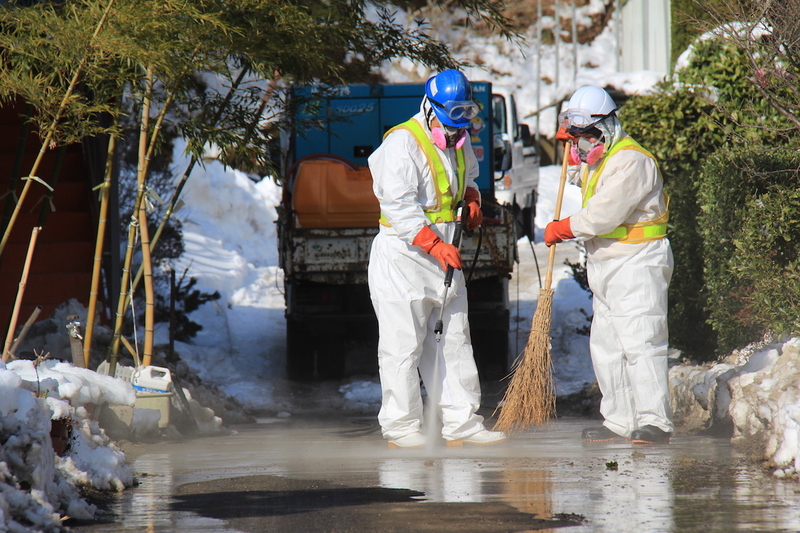 Compared to the broom, the power hose is high tech (January 2012, Iitate, Fukushima). Alleyway between the rows of evacuee housing units. Note the futons set out to air (January 2015, Iwaki, Fukushima). 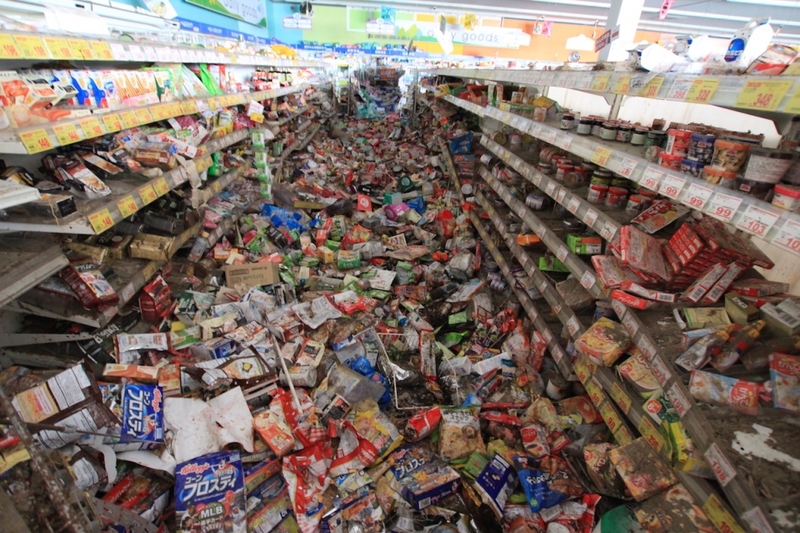 The tsunami flooded this supermarket within the exclusion zone;. A year later, frozen in time, the unsold goods remain lodged in a bed of mud (April 2012, Minami Soma). 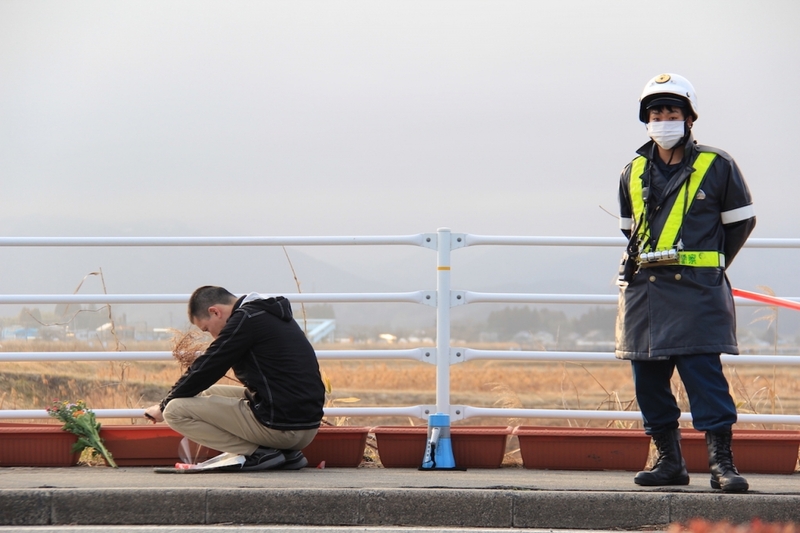 A survivor offers a prayer by the roadside, on the borderline of the exclusion zone (March 11, 2012, Minami Soma, Fukushima). 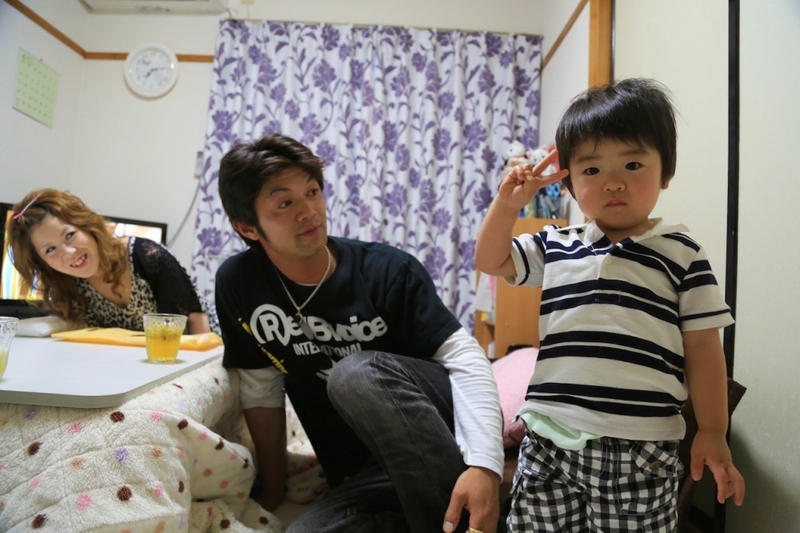 The Tanno family–Konomi, Yuichi and Homa (left to right)–who chose to evacuate from their hometown of Minami Soma (June 2013, Soma, Fukushima). 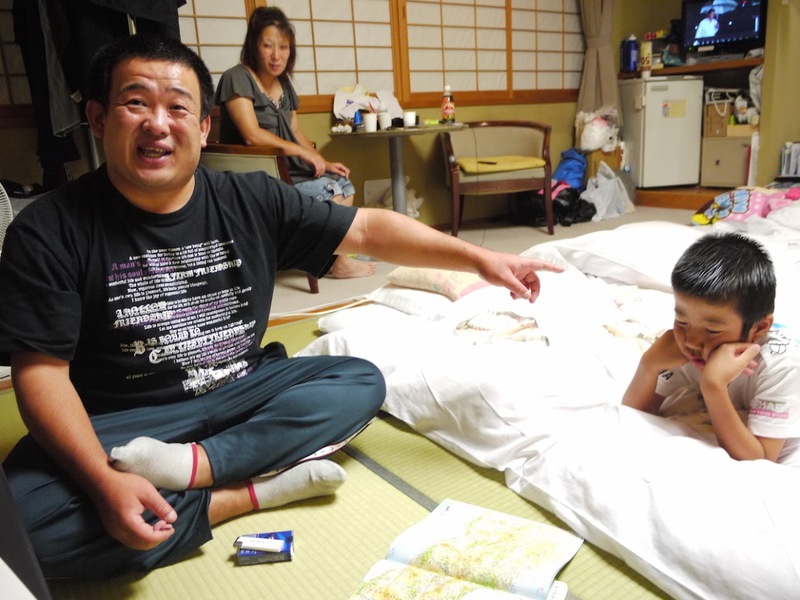 The six member Watanabe family stayed in a small shelter room in the neighboring prefecture of Yamagata (September 2011, Sagae, Yamagata). *Born Hiromichi Ugaya (烏賀陽弘道) in Kyoto City, Japan in 1963, the author started his journalism career as a staff writer / photographer at one of the major national dailies (Japan’s Asahi Shimbun) in 1986, shortly after finishing his bachelor’s degree in Economics at the Kyoto National University. He then worked for 10 years as a staff writer for the national weekly news magazine “AERA” from 1991 to 2001; during that time, Ugaya covered major international news events such as Kobe Earthquake (1995), the cult group Aum Shin Rikkyo’s subway nerve gas attack (1995), and the US Presidential campaign of 1996. Ugaya studied at Columbia University’s School of International and Public Affairs on Rotary Foundation’s scholarship, receiving his Master’s degree in 1994; his concentration was in International Military Policy and US/Japan Security Issues. 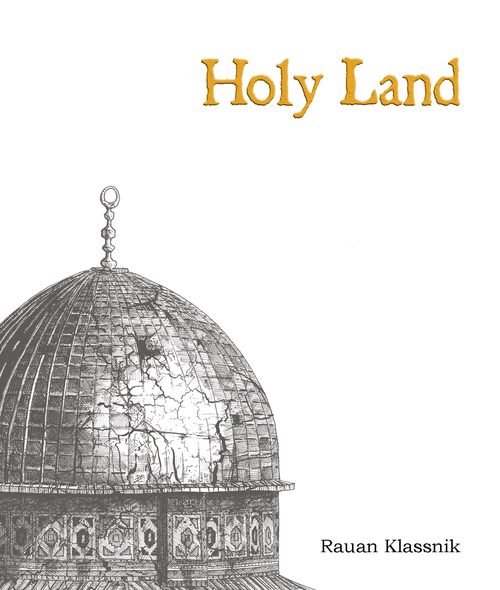 He also served as a foreign correspondent of Aera magazine to New York from 1998 to 1999. 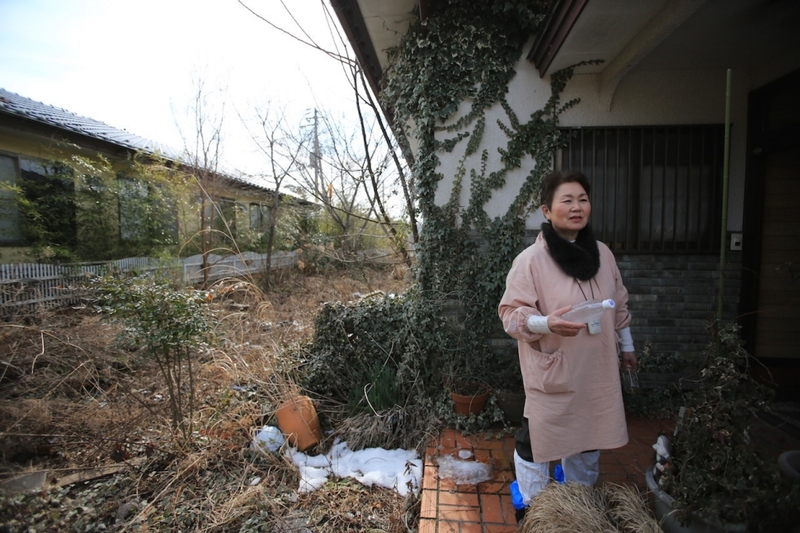 Ugaya turned freelancer in 2003, and has since authored 12 books, four of them related to Fukushima’s nuclear disaster. 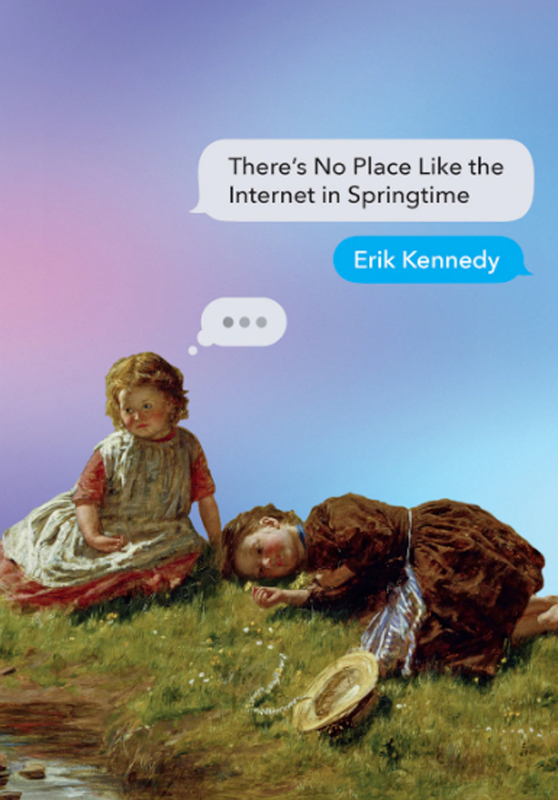 In addition to his journalistic work, he is known as a popular music critic and bass guitar player. Ugaya’s book Portrait of Fukushima: 2011-2015: Life After Meltdown can be purchased here. *David F. Hoenigman’s debut novel, Burn Your Belongings (Jaded Ibis Press, 2010), swiftly moved to cult status and is now taught in college literature and creative writing courses. Originally from Cleveland, Ohio, David has lived in Japan since 1998 and is the founder and organizer of Paint Your Teeth, an avant-garde live performance event regularly held in Tokyo. He is an assistant professor at Meikai University and contributing writer for The Japan Times.